Lithuania - Your future is my future - a European Youth Guarantee now! Last year youth unemployment average was 26.33% in Lithuania. At the end of June this year Lithuanian Social Democratic Party (LSDP) together with Lithuanian Social Democratic Youth Union (LSDYU) took the initiative to implement the 'European Youth Guarantee' campaign in Lithuania launched earlier this year by European Socialist Party (PES). The campaign was presented in the LSDP Congress which took place in June 2012, in Klaipėda. Around 2500 social democrats were welcomed by LSDP leader, Algirdas Butkevičius. In the last month of this summer the Lithuanian Social Democratic Youth Union (LSDYU) has organised its Summer Camp in Daugai, Lithuania. The participants were welcomed by the leader of the LSDYJ Juras Požela and LSDP leader Algirdas Butkevičius. 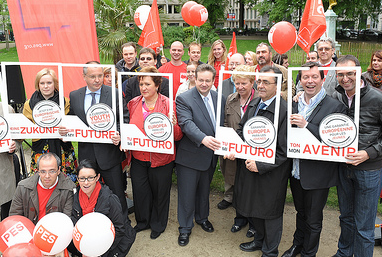 During this Summer Camp the campaign "Your future is my future - a European Youth Guarantee now" was presented. Young social democrats participated in the lectures, discussed the role of the youth in achieving the victory in the elections, women in politics and youth unemployment.